As a prosthodontist, Dr. Meserkhani specializes in replacing missing teeth and restoring natural teeth. Badly broken down or missing teeth don’t have to be lived with and don’t have to be either painful or very costly to fix. Dr. Meserkhani focuses on giving people back full functionality and beauty to their smile using the latest in technology, making the experience efficient and comfortable. With full-mouth reconstruction all of a patient’s teeth are restored to health or replaced. This makeover not only creates a beautiful, healthy smile, it enhances the person’s overall facial appearance. A bright, straight and healthy smile is in itself rejuvenating, and when the bite is improved, and a full set of teeth are present to support the lower face, it can also act as a facelift. 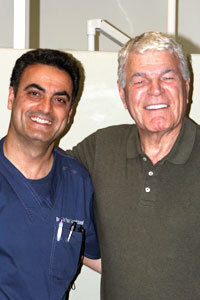 Dr. Meserkhani is a specialist in replacing and restoring teeth. Dr. Vahik Meserkhani is a well-known prosthodontist—a dentist who specializes in replacing missing teeth and restoring natural teeth. He lectures internationally on prosthodontics and oral implantology. An advocate of “progressive dentistry”, he has constantly increased and refined his skills. Dr. Meserkhani has been awarded a Diplomate from the American Board of Oral Implantology, the most important and difficult certification in oral implantology, a certification that has been awarded to less than 500 dentists in the United States since 1969. As a prosthodontist and an oral implantologist Dr. Meserkhani employs his unique skills to create harmony in function and aesthetics in a person’s mouth. 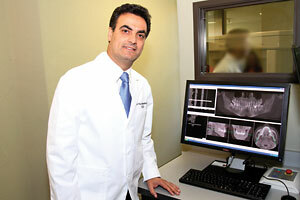 Dr. Meserkhani uses his own private lab to ensure that all ceramic work is of a high standard. 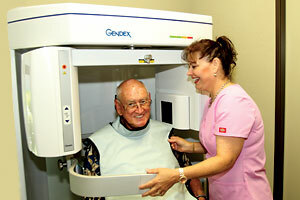 He can monitor the exact color and shape and customize crowns, dentures and veneers for each individual. 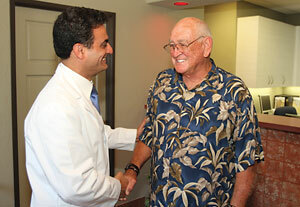 The first step for any patient is a consultation with Dr. Meserkhani. 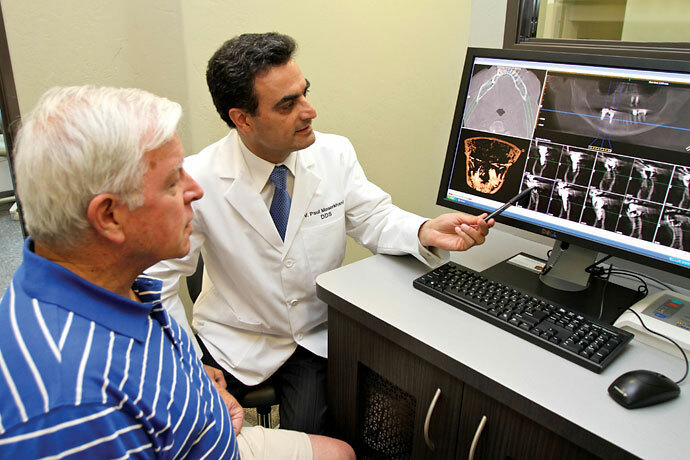 This is a very comprehensive consultation in which Dr. Meserkhani gets the basic information needed to formulate a treatment plan with several options, and to discuss the patient’s goals and answer any questions. 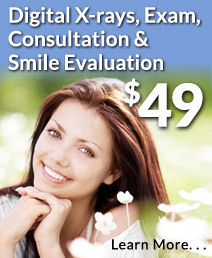 For a limited time Dr. Meserkhani is offering this very comprehensive consultation for no charge! When you come to Rancho San Diego Dental you have the advantage of being treated by three experts who come together to plan your full-mouth reconstruction and to give you the best possible treatment. You’ll be happy with the results of your treatment! For many cases, Dr. Meserkhani teams up with our periodontist, Dr. Henriod to handle aggressive gum disease, and Dr. Christensen for his expertise in biomimetic dentistry. Dr. Meserkhani usually performs all or most of the procedure, including the final restorations (bridges, crowns or dentures). A full-mouth reconstruction generally includes a combination of dental implants, implant-supported bridges and sometimes implant-supported dentures. This patient’s molars were replaced using dental implants. 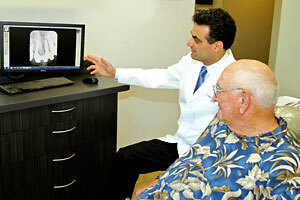 This patient received various procedures to restore their teeth. Ceramic crowns were used to repair this patient’s teeth. This patient received ceramic crowns to beautify their smile. This full mouth reconstruction included implants and crowns. Implants and veneers repaired this patient’s front teeth. Implants were used to replace these missing teeth. Multiple procedures were used to rebuild this patient’s teeth. This patient’s missing front tooth was repaired using an implant and crown.